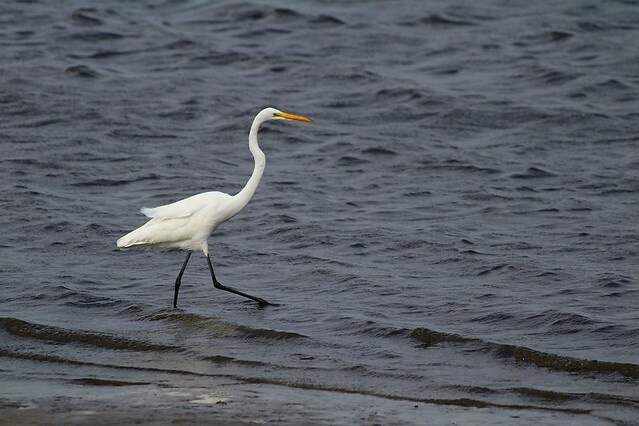 Bird Creek Park is located at the end of CR 40/Follow That Dream Trail, which winds through salt marsh and tidal creeks down to Withlacoochee Bay and the Gulf of Mexico. As you follow the last 5 miles of the road, watch for Roseate Spoonbill, Wood Stork, Anhinga, Great Egrets and both species of night-heron; stop at pull-offs for better looks along the way. Scan the horizon for Bald Eagle, Osprey, and the occasional Mississippi Kite (summer). The small, scattered hardwood hammocks at the park can produce migratory songbirds during the spring and fall such as Yellow-throated Vireo, Black-throated Blue Warbler, Ovenbird, Yellow-billed Cuckoo and Yellow-breasted Chat. Several kayak put-in points (bring your own) alongside the road and at the park offer nice access to the salt marsh, the Withlacoochee River and Withlacoochee Bay. For larger boats, a ramp is provided past the park entrance at the end of CR 40.